How can one of the most vicious villains in the Marvel Universe ever hope to be a hero? That's a good question – and one that will be answered in this fall's Axis: Carnage limited series. 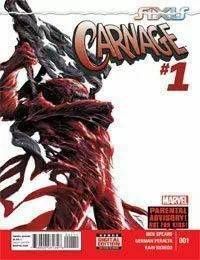 As part of the over-arching Avengers &amp; X-Men: Axis event, Carnage is one of the characters that will undergo “inversion” which will see them flip to be in many ways the opposite of what they once were. On the surface, the idea of Carnage becoming the opposite of the bloodthirsty threat that made even Venom looked tame may seem shocking – and it should be.<br />Scheduled to debut October 29, the three-issue Axis: Carnage series will see Cletus Kasady and the Carnage symbiote return to New York City and try to balance being a superhero and a psychopath. Series writer Rick Spears says the core of this series is balancing who Carnage is and what readers love about him with the predicament of being a hero, and all the innocent bystanders who might be caught in the way.